Time is running out for the Palestinian hope for a two-state solution. Thus, the Palestinians desperately search for a way out of the stalemate in the conflict with Israel and thereby clutch at every straw. Statements made by Palestinian officials such as “Kosovo is not better than us. We deserve independence even before Kosovo, [...]”(Yasser Abed Rabbo) or “We are not Kosovo”(Saeb Erekat) were a prelude to a public and scientific debate about the applicability of the Kosovo Albanian strategy on their way towards statehood on the Palestinian case. 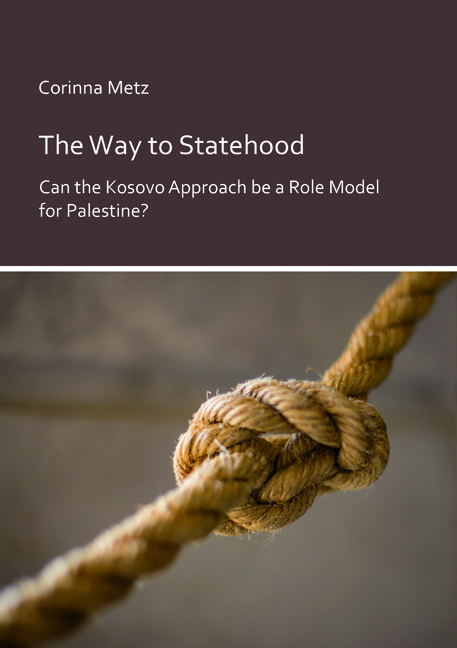 The author took up the issue for a detailed academic analysis that puts into question whether the declaration of independence of Kosovo in 2008 really unveiled new options for Palestine. Thereby, the study illustrates the purpose and limits of analogy. Corinna Metz, born in 1986, lives and works in Ljubljana, Slovenia. She received her doctoral degree from the University of Vienna in Political Sciences with specialization in international politics and a master’s degree in International Development. For several years, she conducts research in the field of peace and conflict studies with a focus on the Balkans and the Middle East where she conducted long-term research stays.